When Khun Mae visit other countries and even within Thailand, some people mistaken her for a bhikkuni (female monk). But Khun Mae is actually a 8 preceptor mae chi (nun) and is known as Khun Mae Methika because she teaches Dhamma. She wears a brown robe because during her initial years as a nun, she had chosen to undergone strict ascetic practice- going tudong, sometimes with other nuns, mostly alone to forests, cemeteries, caves, etc. 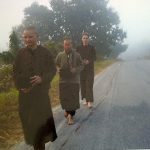 For 3 years, she never wore shoes (as monks on tudong are also barefoot) and did not touch money. When you are living in forests and undergoing ascetic practices, it is not practical to wear the traditional white robe. Above: Khun Mae bringing Mae Chee Baibun and a lady from Europe on morning almsround at the highlands of Mae Hong Son in December 2007. But for those of us who have stayed with Khun Mae for a while, we are well aware that she practices much more than the 8 precepts. There are many aspects that she taught us, from the way we bow, sit, eat, using requisites and much more encompasses the path of practice. More than 10 years ago, when she initially went to a temple of a well known senior monk, to pay respect to the teacher, she was condemned by a woman there. The woman said some very nasty things to her which I think it’s not appropriate to write her. When Khun Mae reached the hall, the well-known and very respected monk was having his morning meal. Khun Mere sat in Samadhi (meditation) and asked the question, “Does it matter what is the color of my robe?”. After that incident, no one from the temple ever said anything negative about her robe. There were probably just a few curious questions but that’s about it. Khun Mae had visited the senior monk almost every year, and he never once commented or asked her why she had worn brown robes. This great teacher knows, and therefore need not ask. It’s the same with other places where I’ve followed Khun Mae to meet virtuous meditation masters. They never looked or asked about her robes- it is not the outward that the great teachers look at- it is the heart. And they know the purity of Khun Mae’s heart. There were a few well known Phra Ajahns (teachers) who had been known to be abrupt to those visitors with unkind heart and impure intentions – based on experiences shared with me by others who had visited them. When I followed Khun Mae to visit these well-known teachers, they were very friendly and happy to share the Dhamma.